Today is the 76th anniversary of the attack on Pearl Harbor. 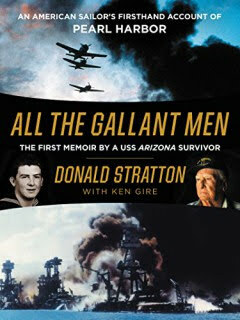 One man who lived through the sinking of the USS Arizona tells his, and his shipmates' story, in his memoir published last year - All the Gallant Men: An American Sailor's Firsthand Account of Pearl Harbor by Donald Stratton (with Ken Gire). At 8:10 a.m. on December 7, 1941, Seaman First Class Donald Stratton was consumed by an inferno. A million pounds of explosives had detonated beneath his battle station aboard the USS Arizona, barely fifteen minutes into Japan’s surprise attack on American forces at Pearl Harbor. Near death and burned across two thirds of his body, Don, a nineteen-year-old Nebraskan who had been steeled by the Great Depression and Dust Bowl, summoned the will to haul himself hand over hand across a rope tethered to a neighboring vessel. Forty-five feet below, the harbor’s flaming, oil-slick water boiled with enemy bullets; all around him the world tore itself apart. You can also read more about this remarkable hero in this short article in the US Naval magazine All Hands.